For spring calving herds, getting cows bred in the late spring and early to midsummer on toxic tall fescue pastures can be a challenge. “I personally prefer fall calving, but I also believe that we can have successful breeding performance in the spring,” writes Roy Burris, extension beef specialist with the University of Kentucky in an article published in their Off the Hoof newsletter. Though there are some obstacles to a spring calving strategy, they can be mostly overcome. In Burris’ opinion, one of the biggest deficiencies he sees is not providing cows adequate nutrition during the winter months to get them in good body condition for spring calving and early rebreeding. Another issue that Burris points to is the fact that lush, watery grass in the early spring might not support regaining body condition that may have been lost during winter. “Cows should enter the breeding season in good body condition,” Burris notes. “This means a body condition score of 5, which doesn’t always follow our winter-feeding programs. It seems that we sometimes try to rough cows through the winter and hope that spring grass will straighten them out. That is a sure formula for delayed breeding or open cows,” he adds. Burris says that spring-calving cows on toxic, high-endophyte tall fescue need to conceive early in the breeding season — before late June. In one University of Kentucky study, cows that were exposed to bulls from mid-April to early June had an 89 percent pregnancy rate. That compared to cows exposed to bulls from mid-June to early August that had a 59 percent pregnancy rate. Burris surmises that the hot midsummer temperatures coupled with the elevated levels of fescue toxin (ergovaline) contributed to the reduced and unacceptable reproductive performance. Short of re-establishing tall fescue pastures, it’s difficult to change the inherent toxicity that exists; however, Burris points out that not all fescue pastures possess the same toxic ergovaline levels. He suggests testing and identifying those pastures with the lowest ergovaline concentrations and use these areas during times of heat stress and breeding. Stay away from the really “hot” pastures, he adds. he challenging growing conditions of 2018 have left many dairy farms short on forage supplies. So, going into the 2019 growing season, what are some options to bolster forage inventories? Mark Sulc, Ohio State University (OSU) Extension forage specialist, and Bill Weiss, OSU Extension dairy specialist, discuss the options available to farmers and some considerations to keep in mind in an article published in the Buckeye Dairy News newsletter. The authors emphasize that corn silage is the number one choice for an annual forage in terms of overall yield and nutritive value. The following options are acceptable short-season forages that can be used to make ends meet, especially if alfalfa winterkill is an issue. Oats: Better adapted to cool, wet soils, and there are several forage varieties available. Spring barley: Usually produces tonnage a little lower than oats or triticale and performs best on well-drained soils. Barley is the earliest maturing for small grains planted in the spring. Spring triticale: A cross between wheat and rye. It is well adapted across a variety of soils and tolerates a low soil pH better than wheat but not to the extent of rye. Italian ryegrass: A biennial with a possible second year production, depending on winter conditions. It is quick to establish and provides high yields of high-quality forage. Forage will be ready to harvest 60 days following seeding and then at 25- to 30-day intervals following for the rest of the first year. “Plant high-quality seed of a named variety to avoid unpleasant surprises,” the authors recommend. For small grain mixes, reduce the seeding rate of each component to 70 percent of the full rate. Forage peas can be added to the mix to raise crude protein levels. Small grains can be planted 1.5 inches deep as early as soil conditions allow, while Italian ryegrass should be planted between April 1 and May 1 no more than 0.5 inches deep. “A burn down application of glyphosate is a cost-effective weed control practice prior to planting,” the authors comment. Additional nitrogen may be needed at 30 to 50 pounds per acre at planting, but manure application can reduce some or all of this needed nitrogen. Italian ryegrass will need about 50 pounds per acre after the first or second harvest. “Maturity affects composition more than species does,” the authors state. The nutritional value of small grain forages declines rapidly with maturity. When harvested at the preboot stage, small grain forages will have around 20 percent crude protein (CP), which varies with the amount of additional nitrogen applied. It will usually test about 40 percent neutral detergent fiber (NDF), 30 percent acid detergent fiber (ADF), and have an in vitro digestibility of around 80 percent. Dry matter (DM) yields will range between 1.5 and 2.4 tons per acre. “Small grain forages harvested in the boot stage have energy concentrations similar to corn silage but with greater concentrations of protein,” the authors explain. At the milk stage, plants have an average of 12 percent CP, 48 percent NDF, 35 percent ADF, and an in vitro digestibility of 62 percent; they have about 10 percent less energy than corn silage. This nutritional content is similar to alfalfa. Dry matter yields generally range from 3 to 4 tons per acre. According to the authors, Italian ryegrass planted in central Ohio produced 2.5 to 4.6 tons of DM per acre in the first year and 1 to 4.5 tons of DM per acre in the second. An NDF content of around 50 percent and CP concentrations between 12 and 16 percent can be expected. If Italian ryegrass is fed as the sole source of forage, milk production will be less than what is seen with corn silage. But according to the authors, if it comprises 15 to 20 percent of the diet’s DM, milk production, composition, and feed efficiency are good. The authors do warn that ryegrass is typically high in potassium, so make sure to supplement magnesium. Above all, the authors recommend testing all harvested forages to provide accurate nutritional values for balancing rations. If mechanically harvesting, chopping and ensiling or making baleage are the best options; getting the material to wilt enough for dry bales is a challenge. Grazing is an effective and affordable alternative to utilizing these forages. Small grains that are young and lush can cause bloat, so feeding a high-quality grass hay, silage, or bloat preventative can help. To reduce potential problems with off-flavored milk, remove lactating dairy cattle from small grain forages at least two hours prior to milking. Everyone wants to increase yield. Usually it means providing more of some type of input. Maybe more fertilizer, or irrigation, or some other thing that will make plants grow at a faster rate. But there is a simple way to make our pastures grow faster and produce greater yield. It involves simply understanding and manipulating a simple principle of plant physiology. That principle is that plants grow at the fastest rate when they have plenty of leaves to capture sunlight, and the leaves are relatively young so they are very efficient at the photosynthetic process. Figure 1 illustrates the three phases of plant growth. In phase 1, the plant doesn’t have much leaf area to capture sunlight. In order to grow leaves, it has to take stored energy from the roots and crown of the plant for the growth. It then moves into phase 2, when the plant has plenty of young, efficient leaves. During this phase, the plant produces plenty of energy for growth, as well as replace the stored energy used during phase 1. As the plant continues to grow, the leaves get older and less efficient at photosynthesis. The plant also produces a seedhead, which means it is trying to produce seed instead of leaves. This results in a decrease in the growth rate of the plant. A simple way to increase the yield of a pasture is to concentrate on keeping your grasses in the phase 2 of plant growth. That means to make sure you leave enough leaf area so the plants can capture plenty of sunlight. But don’t let the plants go to a reproductive state, meaning they are producing seedheads. Staying in phase 2 will improve yield, because that is the phase where the growth rate is the highest. How do you accomplish that? You have to have some type of rotational grazing program, where you control where the animals graze and how long they stay in the paddock. If you find that the forage growth is getting ahead of you in the spring, then cut hay from some of the fields. If you find forage growth is getting slow during the summer, you can do a better job preventing overgrazing. There is no need to make rotational grazing extremely complicated. The principle is controlling plant growth through where the animals graze. This will ultimately improve yield, plant persistence, and the production of forage and beef on your farm. The birds are chirping, the flowers are blooming, and people are sneezing everywhere. Sound like spring to you? With the start of spring comes the start of allergy season, but not for some farm kids, researchers say. While allergists have long known that farm life helps prevent allergies in kids, research shows the benefit might even extend to adults who live near a farm, according to Health Day. Compared to children brought up in the city, those with early life farm exposure typically had fewer cases of asthma, allergies and sinus problems, according to a Thorax journal article. Scientists also found that women who grew up on the farm were shown to have stronger lungs than women with an urban upbringing. Researchers remain unsure what drives the correlation between spending time on the farm and the development of allergies, but they speculate that exposure to certain microbes, air pollution and physical activity could all play a role, as reported in Time Magazine. Too much cleanliness is an additional theory as to why children brought up in the city typically have a higher chance of allergies. It looks like with our modern conditions and cleanliness that we have fewer and fewer germs to fight off,” says Andy Nish, a physician with a private practice in Gainesville, Georgia, in an interview withNational Public Radio.Our immune systems protect us by learning to fight off foreign invaders, whether they’re harmless or not. We can’t train our defenses if we don’t get exposed. And if you’re allergic to one thing, you’re likely allergic to a number of things. Allowing children to grow up on a farm exposes kids to good bacteria, building up their immune systems and lessening their chances for getting sick or having allergies. However, it should be noted that if you suffer from allergies, spending more time on the farm will not cure them. Instead, seek help from a medical professional who can provide you with the proper medication that will help you endure exposure to your allergens. Not all weeds are created equal in terms of their impact on forage quality and pasture productivity. Broomsedge (Andropogon virginicus), a native warm-season perennial grass, is a weed with few, if any, positive attributes other than it slaps you in the face to say soil pH and fertility are likely waning. Known as an indicator plant, broomsedge most often fills voids left bare by more desirable pasture species. Usually, a soil test of these pastures will reveal either a very low soil pH and/or deficient phosphorus levels. It’s also possible that a low soil pH is inhibiting phosphorus uptake. Philipp also notes that allelopathic chemicals in broomsedge prevent other plants from germinating around them. This enhances its ability to compete with desirable forage species. Preventing broomsedge from establishing is easier than trying to control it once it does appear. Other than spot spraying with glyphosate, which will also kill other desirable species, there are no good chemical options for broomsedge control. Many dairy producers are hopeful that the Dairy Margin Coverage (DMC) program through the 2018 Farm Bill will provide a better safety net. Below we’ve pulled together the answers to some frequently asked questions. What is DMC? A new version of the Margin Protection Program (MPP), DMC is a voluntary program that makes payments when the national average income-over-feed-cost margin falls below a farmer-selected coverage level. ) Coverage is now available from $4 per hundredweight to as high as $9.50 per hundredweight. Unlike MPP, program payments may be triggered monthly and are made if the DMC margin falls below the farmer’s elected coverage level. How much milk can I cover with the program? Coverage can range from 5% to 95% of a farm’s milk production history, but can only be covered in 5% increments. For example, you can cover 85%, but you couldn’t cover 87% of your production. Can you explain Tier 1 and Tier 2 coverage? Tier 1 coverage is the first 5 million pounds of production covered by a farm. DMC coverage thresholds for tier 1 production were raised to $9.50. Coverage for Tier 2 remains capped at $8 per hundredweight, however John Newton of the American Farm Bureau Federation says the program is designed to encourage coverage at the $5 and $4.50 levels for farmers covering more than 5 million pounds of milk. What’s this premium discount I’ve heard of? When a farm enrolls in DMC they may receive a 25% premium discount if they make a one-time election for both the coverage level and the amount of milk enrolled in the program. For example, a farmer electing the Tier 1 $9.50 coverage option would receive a 25% discount on premiums for all five coverage years – reducing the premium from 15 cents to 11.25 cents per hundredweight – if a one-time election is made. Is this program really better than MPP? Newton pulled together these charts which compare net benefits, i.e., program payments minus premiums, from DMC $9.50 coverage to $8 coverage for both the Bipartisan Budget Act-improved MPP and the original MPP from 2015 to October 2018. Can you explain the hay change in the feed cost calculation? The new farm bill requires USDA to begin including the price for high-quality alfalfa hay in the NASS monthly price surveys as measured by the volume of milk produced in the top five dairy-producing states. National Milk Producers Federation is urging USDA to include this price point in the DMC calculation, but this has not been finalized. Can I participate in DMC and LGM-Dairy? Yep. The farm bill fully removes the restriction on participation in both the DMC and the Livestock Gross Margin-Dairy (LGM-Dairy) program. Don’t forget, FSA will administer DMC and the Risk Management Agency administers LGM-dairy, but USDA says the agencies are in coordination and producers should have no challenges participating in both programs. Did I miss the sign-up window for DMC? No. Technically farmers can legally obtain coverage under the program beginning January 1, 2019. However, the government shutdown prevented farmers from enrolling as FSA offices were closed. The best thing you can do is contact your FSA representative and ask them when they will be ready to take sign ups. While it may still be winter, the time to start thinking about spring planting is now. A part of that thinking and planning process is choosing adapted and high-performance forage varieties. In The Ohio State University (OSU) Ohio Beef Cattle Letter, OSU Agriculture and Natural Resources Educator Christine Gelley discusses what to keep in mind when selecting future forage genetics for your farm or ranch. Let’s begin with a quick review about the differences between species, varieties, and cultivars. In plant terms, a species is a plant that is distinctly different from other plants in features and characteristics, meaning that other plants of the same species will share similar characteristics. For example, think red clover versus ladino clover; both are clovers, but two distinctly different species. A variety is a variation of a plant characteristic that still falls within the range of characteristics of a species. “Think of varieties as species variations that occur in nature without human interaction,” Gelley explains. While varieties are naturally occurring, humans select for cultivars. These cultivars often bear a trade name that is marketed by the seed company. In spite of the difference between a variety and a cultivar, it remains a common practice for a cultivar to be referred to as a variety. “By the time you are ready to shop for seed, have your species selected and a few potential cultivars on your list of acceptable choices,” Gelley advises. To narrow down your choices even further, look at results of regionally conducted forage variety tests. “If you are farming in Ohio and shopping based on variety performance trials conducted in Tennessee, you may end up unsatisfied with your results,” Gelley explains. Pay attention to variables in the trial, including total rainfall, soil and air temperatures, soil type, fertilizer and pesticide applications, and the number of years evaluated. Trials that were conducted over the span of several years are typically more trustworthy. Also consider who is conducting the trials. Many land-grant universities conduct forage trials and are unbiased. Performance trials by seed companies can be reliable, but keep in mind that they are trying to get you to buy their product instead of a competitor’s. Once you have a short list of varieties that will fit your farm and needs, shop with a reputable supplier. They should have clean facilities, knowledgeable staff, and good customer service. “Contact the seed dealer with your cultivar list and have a conversation about what you are looking for and what they can offer,” Gelley recommends. She also advises looking at the seed tags and comparing production dates, germination rates, and the percentage of pure live seed. “For your best chance at success, do your research before you shop, rather than settling for whatever is in stock at the local co-op,” Gelley says. After selecting, purchasing, and planting your cultivar, keep note of observations you make throughout the year. This includes seeding date, planting rate and depth, weather conditions, germination success or failure, weed pressure, and animal preference. “If you can’t decide between one cultivar and another, get more than one and start your own on-farm research project,” Gelley suggests. Plant the cultivars in the same location under similar conditions. As you go through their production cycle, apply the same inputs and harvest the same way all while taking notes and making observations. The results may surprise you. It’s delicious, it’s nutritious and it’s cheap! 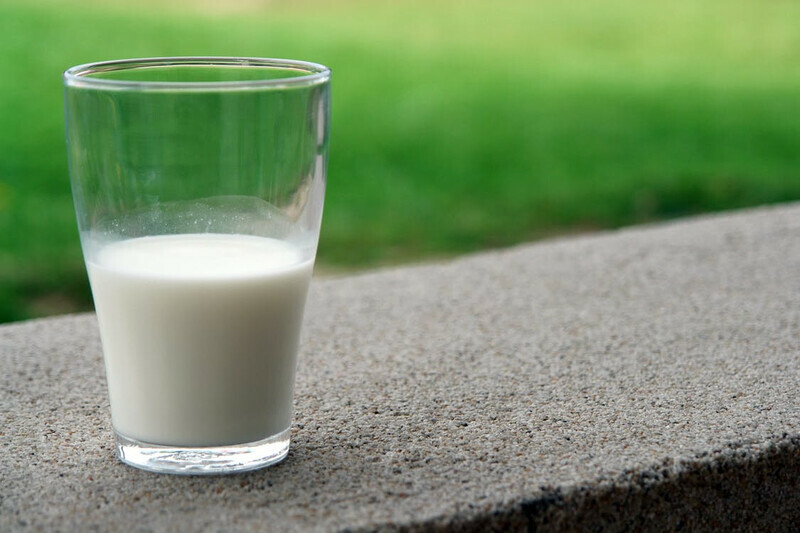 Frequently described as one of “nature’s most perfect foods,” milk and other dairy products are an excellent way to add high-quality nutrition into your diet, no matter what budget you may have. At just 25 cents per glass, milk is a nutritional bargain. Providing nine essential nutrients to nourish your body, dairy products are an excellent source of protein. According to the Food and Drug Administration, the daily value for protein is 50 grams per day. One serving of milk contains 8 grams of protein. If one were to drink three servings of milk, the recommended serving of dairy, they would consume nearly half of their daily protein. All for only 75 cents! Slide the dot to check out just how much daily protein milk provides! Penny for penny, no other food offers as much nutritional return as milk does for America’s families, according to Dairy Management Inc. The average American household spends about 10 percent of their budget on food — nearly $80 a week for groceries, according to Milk Life. If consumers purchased milk each week, they would spend an estimated $628 annually. This is much lower compared to the $1,222 that would be spent on purchasing almond milk. In comparison, dairy milk would save consumers nearly $600 each year! Ranking just behind eggs, milk is one of the most economical ways for consumers to receive high-quality protein. Providing 32 grams of protein per dollar, milk out-ranks other popular forms of protein such as chicken, tuna and ground beef, according to Milk Life.